Dr. Nasser Razack’s expertise is about the brain, but with his patients, it’s all about the heart. As one of only two interventional neuroradiologists in Pinellas County – there are only about 600 in the U.S. – the families that seek Razack’s help frequently present loved ones with irreparable neurological trauma. And dealing with those cases never gets any easier for Razack. But those sad cases also are inspiration for him as he works successfully to prevent or treat conditions that affect the brain, spine and nervous system, such as aneurysms, strokes and tumors. 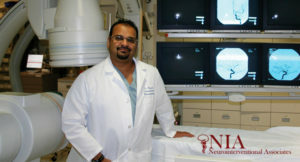 Razack came to St. Petersburg in 2005 and opened his solo practice, Neurointerventional Associates PA. But the real lure at the time was that Bayfront Medical Center had recruited him to design and be the first director of its neuroscience center, which he already had done at the University of Michigan Health System in Ann Arbor. Since then, Razack also has overseen the design, and is medical director, of the Neuroscience Institute at HCA Northside Hospital St. Petersburg. So far, he’s very pleased with his decision to head south. The commitment of the healthcare facilities and the quality of care is “no different here than running a top academic center,” as he did in Michigan, he said. “The advantage here is that at a hospital like Northside they give you the flexibility to set it up like you want. Having done this a few times, that’s a good thing,” Razack said. But the 43-year-old bachelor also had personal motivations to move to Florida. His parents live in the Orlando area. So do two of his three siblings; one is a child psychologist and one is a neurosurgeon. Razack’s father, Sayeed, is a retired otolaryngologist and his mother, Parveen, a homemaker. Razack is generous with praise for his upbringing. “My father was and probably is the hardest-working man I’ve ever met. Everything he did was for the benefit of our family,” Razack said. “My mother probably is the most loving and nurturing woman I’ve ever met. … Their interactions shaped my principles: Work hard and prioritize the people you care about,” he said. That advice served Razack well growing up in Buffalo, N.Y., and when he earned his undergraduate degrees in neurobiology and classical archaeology at the University of Michigan, and later when he obtained his MD at the State University of New York at Buffalo. An internship and residency at NYU’s North Shore University Hospital on Long Island were followed by a fellowship in diagnostic neuroradiology at the University of Virginia, before he went to work at the University of Michigan. Back in those days, Razack also explored his artistic talents as a painter and a sculptor. “I had a huge house with a garage that I used as a studio,” he remembered. “I did a lot of paintings with an oil and paraffin mix, which created a very good texture,” he said. For sculpting, his favorite medium was Bondo, which is the hardening compound used by repairmen in automobile body shops. “You can make anything with that stuff,” Razack said, noting that all his art was inspired by the human anatomy. One painting he did of the cross section of a brain was exhibited at the Philadelphia Museum of Art. “Most people interpreted it as an abstract, but it was anatomic,” he said. Razack has difficulty finding time for such pursuits these days. Almost all his spare time is devoted to a book that he’s been working on for more than a year. “It’s the most monumental project I’ve ever been engaged in,” he said. It is being written for laymen and it’s about the prevention of stroke and Alzheimer’s disease. “Both diseases have multifactorial causes and identical risk factors. Remarkably, there are very simple steps the public can take to reduce the incidence of either of these devastating diseases,” he explained. The book “basically describes three biochemical processes or mechanisms that we Americans expose ourselves to that, based on choices in our lifestyle and diet, rev up these processes in our bodies,” Razack said. “Most people go to the doctor or hospital and expect to get a magic pill or a device, like a stent, to (make them better). But the reality is that the processes that caused the disease have not been addressed. They continue to fester and insidiously develop in the body. If we readdress our thinking of disease and know how to prevent the disease from occurring, we can really do a lot,” he said. “Unfortunately, I see the incapacitating nature of these diseases daily. The best-case scenario for procedural-based physicians may be able to help thousands of patients. However, if we could convey basic knowledge that would allow the public to be proactive in the prevention in these diseases, we may be able to touch the lives of millions,” Razack said. It probably will be another year before he finishes the book, Razack said. In the meantime, he continues to nurture his lifelong intrigue with the brain.